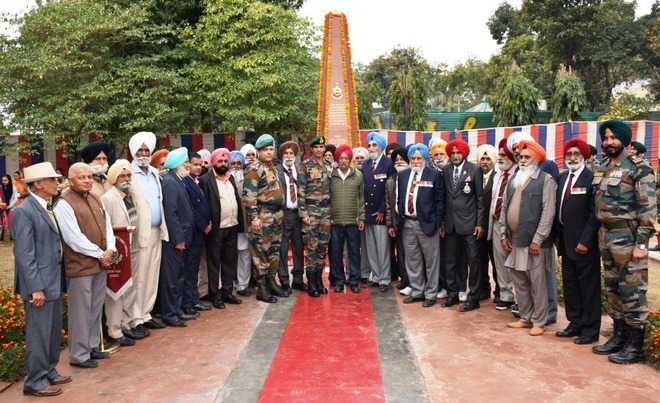 Tributes were paid to the heroes of the Chhamb battle of 1971 at a solemn ceremony at Pannu War Memorial in Akhnoor under the aegis of the Crossed Swords Division on Wednesday. A contingent of the 5 Sikh Regiment comprising Junior Commissioned Officers and other ranks was also present. It also paid homage to the heroes of their unit. “Over a period of four days, the brave soldiers successfully repulsed as many as 14 attacks, thereby foiling the designs of the Pakistan army in the sector. The brave soldiers stood fast till the end despite all odds and inflicted prohibitive losses on the enemy. Many of them, including Major DS Pannu, the Company Commander, sacrificed their lives in the line of duty in the finest traditions of the Indian Army,” he said. On the solemn occasion, Maj Gen Rajinder Dewan, General Officer Commanding, Crossed Swords Division, Col NJS Pannu (retd), brother of Late Major DS Pannu, who was awarded the Vir Chakra posthumously, and other serving and retired soldiers laid wreaths at Pannu War Memorial. A kirtan, ardas and langar were also organised at the memorial. A number of ex-servicemen and locals also attended the ceremony and paid respects to the brave sons of the nation.